"I feel again That joy which brings her art to faultless flower, That passion of her kings, who, reign on reign, Arrayed her star by star with pride and power." Published by Richard G. Badger on April 30, 1903. 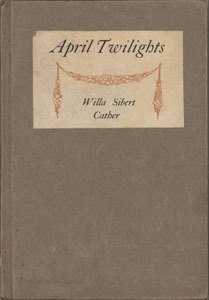 Published with revisions as April Twilights and Other Poems by Alfred A. Knopf on February 20, 1923. Published by William Heinemann in September 1924. Published by Houghton Mifflin in 1937. Published in Poet-lore in Winter 1903 and collected by L. Brent Bohlke in Willa Cather in Person: Interviews, Speeches, and Letters.